It's April. The end of April. It's about to get really hot here in Atlanta for a couple months. I don't know about you, but I'm already wishing it was October. I mean, I have friends who always wish it was October, but at the moment, I'm ready for it as well. When many think about October, they think about ghosts and candy. 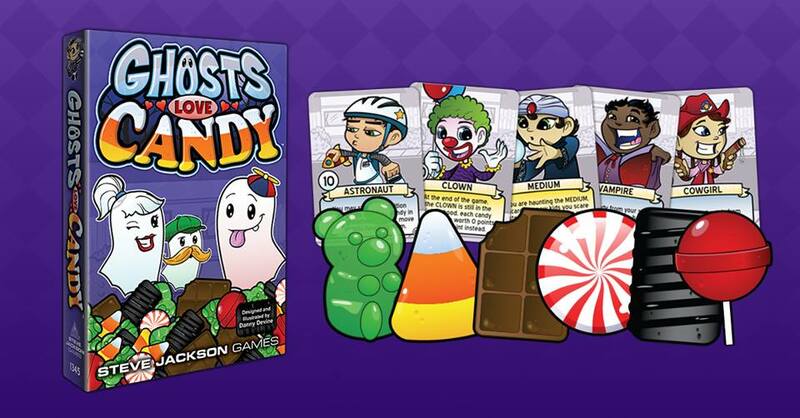 Well, Steve Jackson is helping get that October feel here in April by taking pre-orders for Ghosts Love Candy. Preorder Ghosts Love Candy, coming out in June! You're a ghost, and you love candy. Spook the kids to get their candy, but watch out! If you scare them too much, that's bad news. With easy rules, fast gameplay, and adorable art, Ghosts Love Candy is a perfect game for any specters!